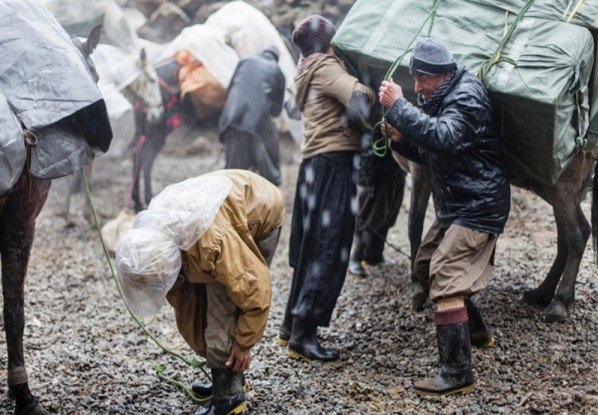 In the border regions of Iran, one of the most hazardous and arduous ways of eking a living is to become a porter, a human mule or a Kulbar as the locals call the one who transports loads on one’s back through the mountainous regions. This has become a common trade in the border regions of Kurdistan, Western Azerbaijan, Kermanshah, Ilam, and parts of Sistan and Baluchistan provinces. Most Kulbars are however active in the west of the country. Kulbars or human mules in Kurdistan, Iran. Kulbars face many hazards such as the danger of frostbites, avalanches, falling to their death and getting shot at by border or Revolutionary Guards as they transport their loads in the rugged mountainous terrains. The regions that most Kulbars are from are among the most deprived regions of the country. A Ferdowsi University research reveals that Kurdistan, Western Azerbaijan, and Sistan and Baluchistan are the three provinces with the lowest levels of development in the country. The border regions have the highest unemployment rate. Poverty and lack of opportunity in the border regions explains why so many people are prepared to take on the hazardous task of being a Kulbar to provide for their families. The government has made no effort to create jobs in the region, and instead, it has pronounced Kulbars criminals engaged in illegal activities of smuggling goods. This has given border guards unrestricted authority in opening fire on Kulbars. Border guards also justify initiatives such as blocking border passes, digging wide holes, building border walls and killing the Kulbars’ horses or mules as a means of securing the country’s borders. In parts of Sistan and Baluchistan Kulbars also turned to this activity for the same reasons of poverty and lack of employment. It is notable however that despite the fact that the vast majority of Kulbars are in the western parts of the country, the Iranian leader refers to Sistan and Baluchistan in the east. While Ayatollah Khamenei’s statements are usually transformed into government directives, there has been no significant drop in the state aggression against Kulbars. A recent government initiative proposed registration and provision of insurance for Kulbars; however, the bill did not pass. Sardasht and Piranshahr representative in parliament Rasoul Khezri reported in July of 2017 that the government was looking at providing insurance that would cover health, blood money, disability, and welfare as well as a pension for Kulbars that would kick in after 15 years of employment or at the age of 65. He added that Kulbars would only be responsible for five percent of the insurance premiums and the rest would be divided between the various levels of government for which the Ministry of Labor had announced a budget of nine trillion rials. The bill was stalled in parliament until they finally announced since being a Kulbar is not a permanent job, the insurance initiative cannot be practically implemented. With the scrapping of the parliamentary initiative to provide Kulbars with insurance, the hopes of Kulbars across the country to improve their lot, including 17 thousand who only in Kurdistan had acquired the necessary documentation, were dashed. While the government initiatives clearly reveal that the government is aware of the dire situation that forces Kulbars into taking on this arduous and hazardous activity, it chooses to remain silent vis-à-vis the shooting and killing of Kulbars by border guards. The rising number of Kulbar deaths has triggered civil campaigns against government criminalization of this activity. “Stop the Killing of Kulbars” is a campaign signed so far by 2,200 petitioners calling for government action to stop border guards from shooting at Kulbars. They are calling for poverty relief, job creation and lifting of the security approach to border regions as solutions to this problem. These poor Kulbar’s. How are they supposed to even LIVE 15 years to obtain the benefits proposed (that did not pass). Someone might not even live 3 years with this terrible work situation. It is not appropriate for humans to live this way. This should be forbidden. More work opportunities should be given…or government benefits or relocation assistance so they can go to a better area..and help with education to become qualified. at these bloggers to see whether there are any characteristics that they share. This magic phrase is repeated over furthermore again. source. The better of source of online wages are writing articles online.